After the global technological apocalypse has run its course, the entire Young Winos online infrastructure — right down to the piece you’re reading now — will be gone forever, lost in a tangled heap of binary wreckage. But do you know what will still be around? Magazines, of course! (…along with numerous other items that aren’t computer related.) That’s why the Winos were so thrilled to be featured in the new issue of Mutineer Magazine, our absolute favorite alternative beverage publication. An expanded version of my coverage of the Mutineer National Launch Party is featured as a special report in the magazine’s August/September issue! Several familiar Wino mugs grace the mag’s glossy pages, including pics of Max, Andrea, blurry Noah, and myself. 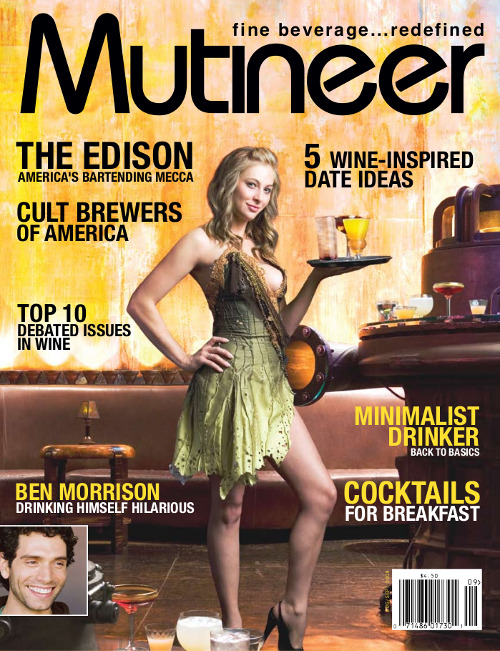 The subject of this month’s cover story is LA’s own ridiculously cool Edison; other awesome pieces include “The Cult Brewers of America” and “The Minimalist Drinker,” along with a list of ten wine blogs (besides ours, I believe they meant to imply) that you should be reading. Mutineer can be found on the shelves of numerous retailers large and small, including such formidable names as Barnes, Noble, Borders, Vons and Safeway (a full list can be found here). Or, for the price of three single issues, you could instead subscribe for a year — six issues delivered to your doorstep for $14.95. It’s a worthy investment, Winos… show up at the right events, and you never know when your face might end up staring back at you from the pages of a magazine, while computers explode to the left and right. Great write up of the party…don’t see how it could have been any better. Cheers!